The Slimline Super 8 is our flagship offering, featuring the latest technology available in the industry. It features many of the same things as machines used in professional salons and spas and yet is easy to make use of in the home. The Slimline Super 12 is the ‘big brother’ to our flagship model, as it features 12 pads instead of 8, offering users the chance to target more, or larger, areas of the body in the course of a single session. The Slimline SG 24 features many of the same things as machines used in professional salons and spas and yet is easy to make use of in the home. 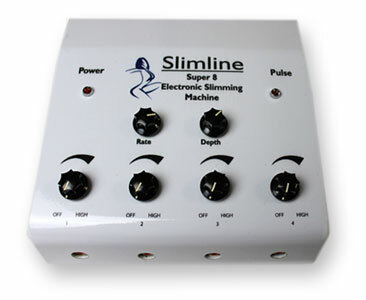 The new range of Slimline Slimming Machines come in non conductive polycarbonate enclosures which are very hard waring and do not dent or rust. All the new range use RSA Universal Connectors which never give trouble. The old 5 pin connectors will never be used again and all the range will use the easy to use RSA plugs. All the new machines are manufactured in the RSA and are easy to service should this be required. All machines come with an anatomically correct padding chart as well as correct instructions for use. As the range is completely new on the market agents in all areas are urgently required. A very good side income can be earned for a very small effort(Via the Internet) Available in 8 and 12 pad format. The new range makes redundant the old steel cases and because of the rugged construction postage is safe. 2. Although the machine is very inexpensive nevertheless it encompasses all the excellent electronics found in the much more expensive Salon machines. 3. The machine is very robust and may be posted worldwide. 4. Slimline 8 and 12 are guaranteed for 3 years from date of sale. 5. Slimline Super 8 and 12 comes with all the straps and silicon pads necessary for use. 6. Full padding charts and easy instructions come with each machine. 7. Good looks. The machine looks great but because it is relatively small it is very easily stored or packed away. 8. The Super 8 and 12 are sold directly from the factory for very low price so you get the benefit of no middleman. 10. 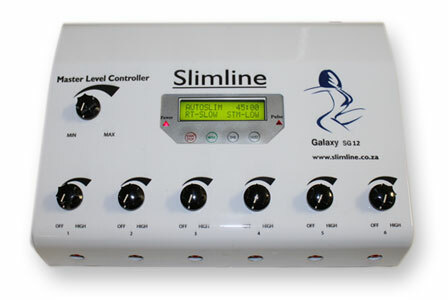 Only Slimline have the special Slow Rise effect in their machines. Also only Slimline use the RSA plugs for our pad connectors to the machine. We do not use the Brittle 5 pin Star plugs. The Slimline Super 8, 12 and 24 are the latest design from Slimline and encompasses all the expertise which has made Slimline a household name in the slimming world. The Slimline Galaxy SG8 is the latest design from Slimline and encompasses all the expertise which has made Slimline a household name in the slimming world. The Slimline Galaxy SG12 is the latest design from Slimline and encompasses all the expertise which has made Slimline a household name in the slimming world. The Slimline Galaxy SG24 is the latest design from Slimline and encompasses all the expertise which has made Slimline a household name in the slimming world. The business has been in existence since that time producing slimming and beauty equipment for use in both professional and private use. The machines are medically approved and safety tested by the Canadian Standards Authority and the largest safety organisation in the RSA. The padding positions on the padding chart are anatomically correct and must be adhered to. Incorrect placing of the pads will result in poor or no effect. When buying a slimming machine ensure that the persons selling the machine are registered health professionals. All machines are manufactured in the RSA in Pinetown, KZN. The name and padding positions are registered and litigation will follow any infringement of copyright.